Since I moved in Dubai for the second time almost one year ago, I have been receiving daily calls from wealth managers, hedge funds and other similar companies willing to get a slice of my monthly income to be invested. The majority of the people that contacted me proposed investments with high and captivating yields, life insurances with fantastic benefits and retirement plans that were supposed to be the best thing I could have done with my money. Most of the time there are hidden costs that devour the invested capital, reducing the potential returns of the investment, but at least they were offering known products (Generali, Allianz and other providers’ schemes) with a real possibility of getting some benefit. However, I am afraid other companies have a fraudulent intent as the four that started calling me few months ago about an extraordinary investment opportunity. As far as I was told over the phone, two were based in Luxemburg, one in London and the other one from the British Virgin Islands or something similar. 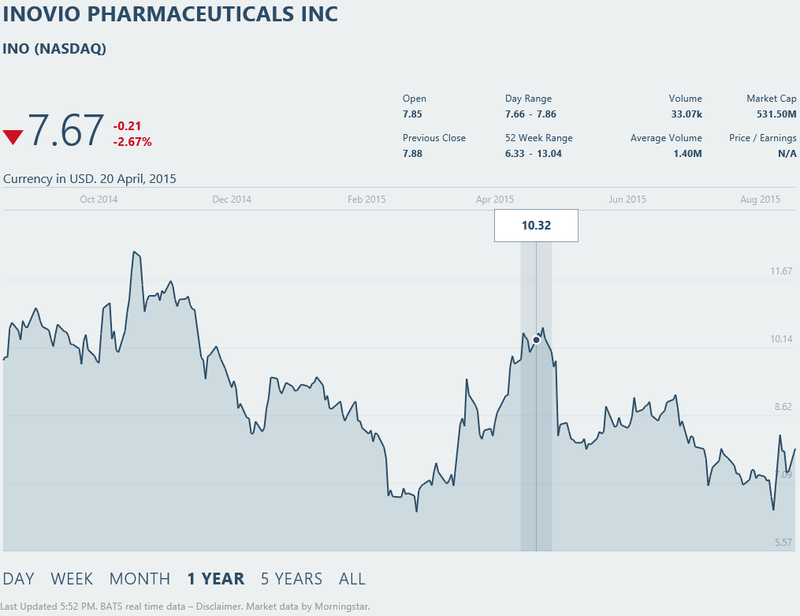 They all warmly invited me to invest a considerable amount of money in the shares of a pharmaceutical company: INOVIO PHARMACEUTICALS inc negotiated on NASDAQ. When the first company called, I was informed that “we have privileged information about INOVIO. We know that a major contract has been recently signed and will be divulged in the next 3/12 weeks. Now, the major contract is due to bring the shares value up to +60% in few days after the news has been circulated. If you want to take advantage of the situation, just name myself as your wealth manager and invest a minimum of 50,000 USD and I guarantee you that in 3 to 6 months you will get at least 80,000 USD”. As usual, if it sounds too good to be true, it is a scam I thought and declined the invite saying that I had to study INOVIO before accepting anything. Almost two weeks later, INOVIO value was slightly increased when I received another call. Same modus operandi, same exceptional gain to be cashed in few weeks and the like. They were even more aggressive than the first company. Inovio shares were at around 10 USD per share and the guy told me “I am saying that most probably the shares will be touching 20 USD very soon and the guarantee threshold for this operation is at least 16 USD”. I have asked about the nature of the privileged information they were sharing with me and why they were involving me (mr. no one) instead of some big money manager. The answer was elusive. I repeatedly refused the invitation of these gentlemen that periodically came even with falling prices. From the very first call I received, the Inovio shares dropped of a considerable -25%. Still waiting for the new contract to be announced? This entry was posted in Financial Markets, Investments, News, Opinion, Scams & Warnings and tagged Beware, financial markets, Inovio, Inovio Pharmaceuticals, investments strategies, Nasdaq, news of the world, Scam on August 18, 2015 by andreadetto. There are many reasons that can lead a person to change apartment in Dubai. Most of the time are economical, with tenants looking for better deals in other neighborhoods when prices increase in the most popular ones. Other times the landlord might decide to sell the apartment or move in himself, hence requests you to vacate. The first step is to look for a new apartment and the best way to do so is to check the listings in the most popular websites like Dubizzle or Property Finder. It is a hard job and it can drive you nuts if you don’t approach it in the right way. Once you have found the right apartment, you need to take care of various formalities and move your furniture (if any) or other personal belongings in the new place without getting lost. Here a simple list of things you should take in consideration before moving. Before moving in, ask your agent or the landlord to provide you with DEWA’s and Air Conditioning’s final bills. Be sure the previous tenant and/or the landlord had paid all the outstanding dues that otherwise you will be forced to clear in case you desperately need to use that service. The risk is that once you have paid, the landlord might take his time to refund you or trying to avoid paying. Do the same for the apartment you are vacating. The documents shall be handed over to the landlord for your peace of mind and in respect of the regulations. Don’t fall for the most common scam we have luckily avoided. Many agents will propose to take care of DEWA/Air.Con/Internet/Ejari registrations for a small fee of 1,500 AED (that doesn’t include the commissions I am going to list)!!! You can easily connect/disconnect Palm Utilities Air Conditioning with one e-mail at no fee ( I do not know about other providers). DEWA is matter of half an hour and costs 110 AED of commissions plus 2,000 AED of refundable deposit. Ejari registration costs 195 AED and it takes very little in one of the authorized typing centers. Du phone and internet connection can be relocated with 100 AED fee. Among the various utilities, Du is the one that requires more time since the Du offices in non-working hours are always very busy. There are cheaper companies that offer to take care of all the mentioned services with as little as 500/600 AED (plus the fees and deposit costs of course). Up to you to decide if it is worth spending that amount of money in order to save some time and headache. Before having the moving company or any other person helping you out with the furniture, ask your building security if you have to provide any document. In some towers, indeed, it is requested to fill a form, provide a copy of the tenancy contract and a refundable security deposit of 5,000 AED in order to cover any possible damage the moving company might have done. That’s another reason why choosing the right moving company is very important not only for your furniture’s sake. If you forget to inform the security, you might find yourself with the movers at the door and the security prohibiting them to access the building (ad it happened to a friend of mine). Be ready to bargain. Get quotations from at least 3/4 different companies that usually ranges from 1,000 AED to 1,300 AED for the same service: pack everything from your old apartment, transport it and unpack everything in the new apartment. Don’t be shy and ask for a discount because the rate is too high and you have received another quotation that is much cheaper (you will have always a quotation that is cheaper than the others). We bargained with all of them and dropped the price to 900 AED. We have opted for Executive Movers, that was warmly recommended by a dear friend that was enthusiastic of their service she used a month ago circa. We packed some of our personal things by ourselves in order to have strangers looking and touching at our things but we have overdone it. In the packing frenzy we filled 4 boxes and 3 luggage of personal and delicate things. The day the movers came, I was positively shocked. 4 Filipino came with tools, boxes and paper wrap and started packing every single piece of furniture at a speed that was incredible. Everything perfectly sealed, protected, covered, wrapped with paper and/ore bubble wrap. They dismantled bed, wardrobe and bookshelves and packed everything carefully. In 2 hours our apartment was ready for shipment. In the new apartment, they positioned everything at his own place, including the books in the bookshelves and the cup in the cupboards. Not even a scratch to our wardrobe or broken glass. 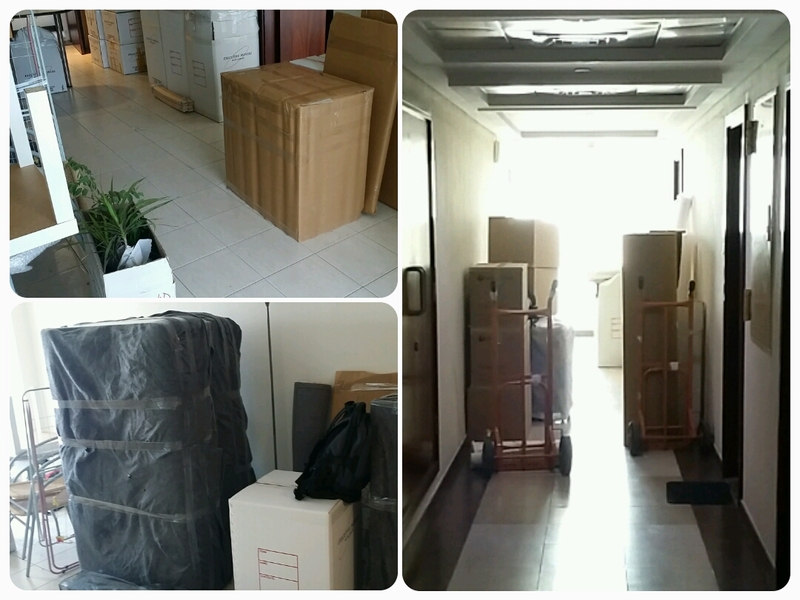 We noticed that the same day there was another tenant moving out the tower and his moving company was one of the competitors from which we got a quotation matching the 900 AED agreed with Executive Movers. The service, however, was dramatically lower. They stored the furniture of the unfortunate tenant outside for hours, under the sun and exposed high temperature and humidity and transported it in a old and uncovered truck. I would definitely recommend Executive Movers for your moving needs. This entry was posted in Dubai, Dubai Property Market, JLT, Scams & Warnings and tagged Beware, Cost of Living, DEWA Final Bill, Du, dubai, Dubizzle, Executive Movers, JLT, Life in Dubai, Moving, Moving out, Palm Utilities, Relocating, Scam, Tips on August 2, 2015 by andreadetto. 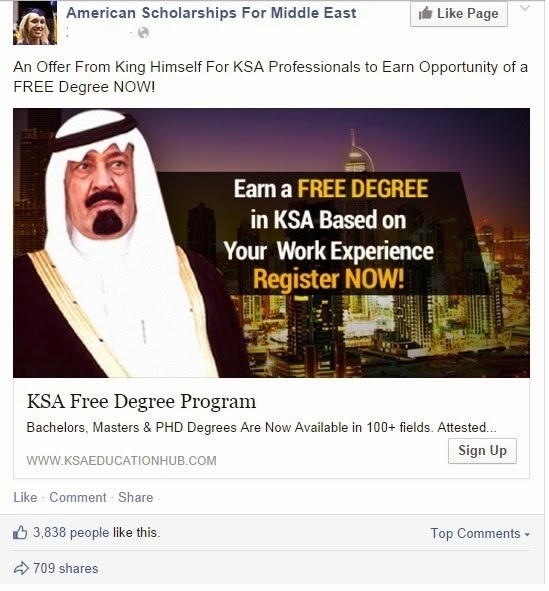 BEWARE: Education scams in Middle East! We are daily exposed to several attempts to illicitly get either money or personal data through internet or phone calls. I have always been very careful in avoiding clicking in anything suspicious but one day I committed an error. I was looking for a new job opportunity and thought that a new certification to be added to my university degree would have been useful to enhance my visibility and market penetration. I therefore started looking for e-learning courses provided by Universities or specialized schools to verify the possibility to earn an additional skill/knowledge and relevant certificate. At that time I was in Saudi Arabia and I remember that after few clicks, a certain number of commercials started appearing on the major social media. Among the various options, my attention was caught by KSA Education Hub that was offering a professional experience certification for a better career path for just USD 300. There was a reassuring picture of King Abdullah of Saudi Arabia and it seemed very professional and trust-able. KSA Education Portal – Every country has a different domain and photo. I was curious to get some more information and I filled the online form with phone number, e-mail and waited for a feed-back. Few days later I received a call by a certain “Jason Luis” from Los Angeles, CA that introduced himself as a member of the Admission Dept. in Wilburton University. He was very polite and professional and I appreciated the fact that he was calling me when in LA was 1 in the morning. He explained that after enrolment, I would have been contacted by a professor to have a detailed interview aiming to assess my professional competences. If I was able to pass the interview, after few formalities I would have been granted a Certificate recognized worldwide. He then asked me to enroll on a kind of “live session” to smooth the process. I declined because I did not have internet connection at that time and he promised me to call me back the day after and to drop me an e-mail with some further information. Soon after I received the e-mail, I received calls from Mr. “Jason Luis” and from a Mr. “Frank Capparelli” that introduced himself as the Head of Admission Dept. of the University. They both made a certain degree of pressure in order to have me sit in front of the laptop with a Credit Card ready in order to pay the enrollment fee. The pressure was too high. Something sounded wrong. And after that they simply vanished. I warned all my friends on any possible social media about this elaborated hoax and got a feedback from a friend of a friend that told me she was asked by the crooks to pay the 500 USD through Western Union to someone in Qatar. 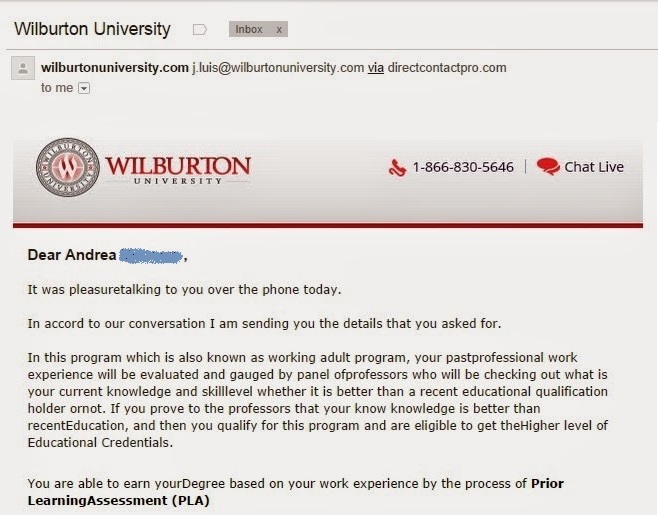 This person should have been the “Professor” appointed to evaluate her experience and then certify it by sending her a brand new Degree/Certificate. Of course she did not pay. After several weeks, I was surprised in seeing the same commercial proposed on Facebook and in noticing how many hundreds likes and positive comments it was getting and how many people shared it with their friends. A screenshot I took at the beginning of 2015 is self-explicative. I spent some months without trouble when, suddenly, I received a call from a Mr. Smith (+85557722111), representative of an American University of which I can’t remember the name but just the website from where I should have enrolled: uae.middleeastscholarships.com. He obviously offered me to get my work experience certified for only 500 USD!!! I abruptly stopped him and promptly asked to receive an e-mail with credentials of the University and his personal one because I suspected it was, again, a scam. Well, the guy quietly told me: “I see. No problem. Maybe I will send you an e-mail later on” and having said so, he dropped the call. Another scam. Same modus operandi, same targets but different names. This entry was posted in Middle East, Scams & Warnings and tagged Beware, cheater, e-mail scam, middle east, Scam on June 11, 2015 by andreadetto. I don’t know if you have already experienced this scam but I would like to warn you against it by sharing my recent experience. Few weeks ago I received a contact request on LinkedIn from a good looking girl supposed to be studying something at the college and that was willing to establish a connection with me. Well the curious thing is that I received exactly the same kind of e-mail from another girl few months ago with the same story but different names and locations. Aware of that, I tried to get more information about the girl saying that I am willing to help standing her availability to send more picture from her place and tell me something more about herself. Well, she disappeared. The girl who wrote me before instead, after my compassionate reply asked me few thousand dollars in order to escape from her country and come to visit me and establish a durable and profitable relationship with me. At that point I understood that it was a scam and proposed to the girl to send me her details because I was willing to buy the tickets and arrange the Visa. Have a guess? She disappeared. Do not send money to this kind of e-mail . . . it is just a SCAM!!! This entry was posted in Scams & Warnings and tagged Beware, e-mail scam, linkedin, Mary Mabou, money, Scam on June 2, 2015 by andreadetto.